Set up your work schedule, promote your work list, and keep track of submitted applications. 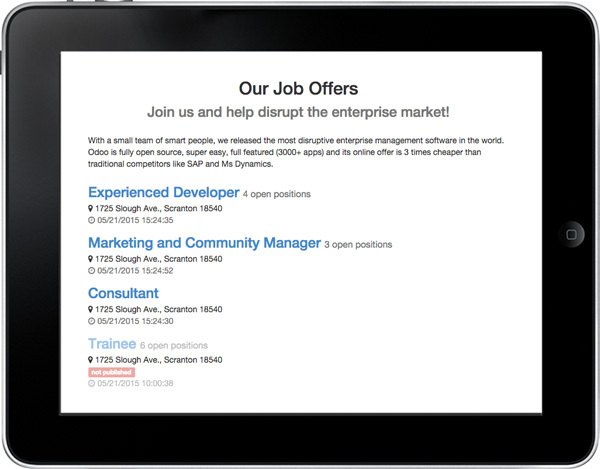 Follow all the candidates and create a database of skills and profiles with indexed documents. Deal with everything internally in a simple and professional way. A new email address is automatically assigned to each job offer in order to route the applications to the right address. If candidates contact you via email or through an online form, get all the data automatically indexed and respond with just one click, using templates or personalized emails. Use the kanban view and customize the stages of your recruitment process: pre-qualification, first interview, second interview, negotiation, etc. Get accurate statistics on your high recruitment moment. Use report to compare the performance of the posts you have made to different external work, and change your strategy and recruitment plan based on your results. 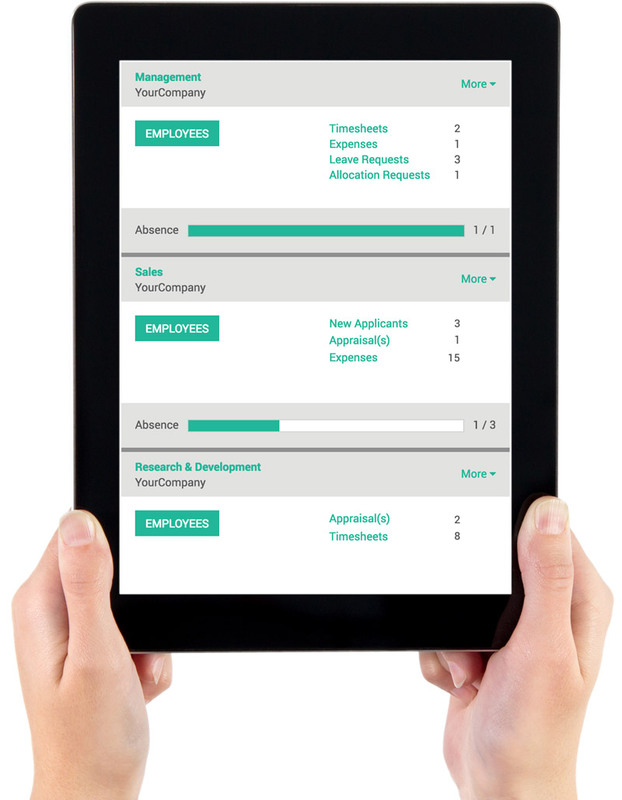 Follow the candidates in the recruitment process with the kanban view. Save time using templates to optimize some communications. Documents such as CVs are indexed automatically, allowing you to easily search for specific skills and the ability to create a profile database. Create your own interview board based on best practice. Ask the candidates to fill out the survey online or ask the interviewer to use it during the actual interviews. Create professional proposals in minutes. Create attractive and elegant event pages. Sell online and organize on site. Manage project forecasts, teams and files. Easily delegate tasks and monitor each step of the project. Want to try Opencloud solution? Supervise all important information for each department at a glance. Restrict the visibility of confidential information only to human resources managers. Receive alerts for any new license requests, allocation request, applications, ratings, and more. Track employees work time and order by project, customer, or task. Easily access statistics to record and analyze timesheets as well as check each employees attendance. Integrated accounting automatically sends reports based on the time spent on projects that provide real time data. Employees record their request (time paid, medical leave, etc). Managers decide to approve or deny time off request. Notification is sent to the employee abd you calendar updates automatically. Get your expenses update and approved quickly. Employees can easily file and justify expenses. Managers can review all expenses and approve or reject individual request as needed. Once approved, the expenses are immediately updated in the application of Accounting. Easily set up your evaluation process and calendar. Create questionnaires to collect feedback from everyone in the company, from employees to managers. Automate the entire process so you can focus on people, not on management tasks. Set up the worksheet and track the submitted applications in just a few clicks. Supervise and manage the high point of the candidates, create a survey that automatically associates with the registration of the candidate. Improve motivation among employees and motivate them through rewards. Enable employees to collaborate across Odoo departments, sites and modules by interacting in real time through live chat, sharing knowledge and best practices, following specific people or documents to stay informed, and joining interest groups to share knowledge and encourage the work of the team. Inspire employees to achieve challenges, goals and rewards. Create your own goals, set clear goals, and provide real time feedback with visible results. Present the best performances for each team and publicly recognize employee and team accomplishments. Manage the daily expenses of your employees has never been easier. Event if it's travel expenses, office supplies, or any other employee expense, access all receipts and expenditures from the expense dashboard and create, validate, or decline with just one click. No need to download specialized software to keep track of expenses - everything can be done directly through the application! Upload all receipts directly to expense records. Employees can easily attach copies of receipts directly to an expense record to avoid losing them. Add attachments anywhere through a mobile device, by taking a picture of the rebound and sending it to the email address. Save and increase efficiency by keeping a clean and complete record of all expenses. Have a clear view of a team's expenses. As a manager, easily track the expenses records of the entire team, to keep an eye on costs and ensure that they keep on target and within budget. Involve everyone and save time. Elaborate expenses, add notes and send receipts to the expense record. Validate or deny expenses in one click. Add comments, edit records, or request additional information. Save the company and employee expenses. Strengthen the main key of your company: employees. Maintain your company's motivational process by periodically evaluating the performance of your employees. Access human resources regularly to bring benefits to your employees and also to your organization, whether small or large. View the evaluation status for each employee or company. Track upcoming reviews and send reminders. Turn each evaluation into a PDF form. Ask the right questions and collect the necessary information. Create an survey to collect the responses of your employees. Prepare your own template or choose from existing ones. It runs several types of evaluations. Use the templates or create them. Create your own surveys to gather important information or opinions from your employees. Quickly add questions, edit pages and make a useful survey, using great built-in templates or creating your own project from scratch. Check your inquiries before posting: get them to the manager, supervisor, or other staff so they can inspect and add comments before finalizing your search. You can create multiple searches for each evaluation step to send them to different people. Make sure that evaluations follow the calendar. Create evaluation plans with a clear schedule to automatically generate interview request. Specify the employee, the department, or level in the hierarchy that can respond to your searches and allow managers to review the content and finalize the evaluation. You do not need a specialized tracking system for every vehicle in the company - with the intelligent application of Odoo, you can get all information about your fleet in a few clicks. It turns everything from the administrative system - registration of fuel, costs and many other resources needed for the management of your company's vehicles. Supervise all contracts for your vehicles and receive a warning email when the contracts reach their expiration date. Several visual tools are put in place to ensure that you remember to renew (or terminate) your contract. Organize the services around vehicles and communicate with qualified services. Identify and locate the money spent by your company for each vehicle. Contract costs, such as loans and service contracts, are automatically added to your accounting at the beginning of each period of the frequency specified in the contracts, while all other costs such as fuel and repairs are automatically added to your report. Show all costs related to a particular vehicle or type of service. Compare the different types os cost (which vehicles cost the most, which services were performed and in which vehicle, etc) using the reporting tool. Get useful information about of each vehicle, to improve your investments. Keep track of each employees vacations days. Staff submits requests and managers approve and validate all in just a few clicks. Each employee agenda is updated according to the approval and validation of the manager. Managers get a view of the whole team, to keep the team well organized, and easily predict the distribution of tasks during the leaves of their members. Allows employees to record their holiday request and receive email notifications of each order. Decide to approve or refuse, and you can add a note to give explanations to your employees. Create reports in a single click for each order. Get absences statistics and plan the next to make sure you maintain productivity at the highest level.